For RETAIL version of review, CLICK HERE. Overview : Similar concept to KontrolFreek's SpeedFreek. Improve your aim, accuracy, control and gaming in First Person Shooter (FPS) games. Quality/Usability : As mentioned above, FPS Freek is based off of KontrolFreek's SpeedFreek. Only difference is that instead of a "U" (half-pipe) shaped control, its similar to that of the Xbox 360 controllers. But why release a controller attachment that is shaped the same as the first-party controllers? Simply put, accuracy. When you move the analog sticks around, it feels a bit stiff. With the FPS Freek, its feels looser and gives you better precision. Too attach the FPS Freek add-on, simply place the FPS Freek over the analog stick and push down until its securely in place. This adds another 1/2 inch in height to the sticks which gives you better leverage to the joystick. Even with the added height, pressing on down on the sticks feels comfortable. As mentioned, with the FPS Freek add-on installed, this gives a better accuracy and control over movement of the joystick. Putting the FPS Freek through our gameplay testing (Ghost Recon Advanced Warfighter 2, Gears of War, Rainbox Six: Vegas 2 and Call of Duty 4), we saw that we were able to make minor aiming adjustments that would cause us to move right by our target on a normal controller. Instead of shooting past enemy heads or wasting bullets trying to shoot a running target, we were able to precisely aim our crosshair/sight onto our enemies even while they were running like a chicken with their heads cut off. I admit, I'm not the best at FPS games as I tend to move my joystick too much just to get the right aim and by the time I get my aim to where I want it, I'm shot dead. With the FPS Freek, I no longer have that problem. My aim has been consistent as well as my kill rate. What I usually average 0-2 kills (if I'm lucky) now gets me 2-5 kills per round/game. Conclusion : Overall, the KontrolFreek FPS Freek Joystick has great potential and will definitely improve aiming accuracy. 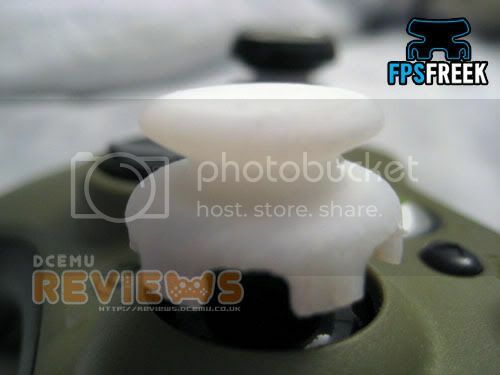 The FPS Freeks we received were prototypes and not finalized retail products. It did not have the rubber caps on top of the add-on, so I went out and bought GelTabz ($5 for the pair) to replicate the final product. KontrolFreek will more than likely also offer the FPS Freek in black just like the SpeedFreek. As of this review, if you preorder you get 20% off when it is available.